Hello, cat lovers and a special welcome to all our new subscribers. We’re sharing something different from our usual Monday blog with Clyde: Cute Cat Art From Around The Globe. As many of you know, we have two Instagram communities @catwisdom101 and a feature account @blackcatsofIG where we feature followers daily. On Mondays we feature black cat art in a wide range of styles and mediums. If you feel so inclined, we’d love you to follow us there. Just click on the links above and sign up. You can sign up for an account and not use it except to view content. Not on Instagram and don’t want to use it? You can still view posts, read comments without joining or logging in. Click on either link above. Today we featured an IGTV video with Clyde on Instagram but couldn’t figure out how to post it here. Instead we’re featuring our Cat Art Monday post. 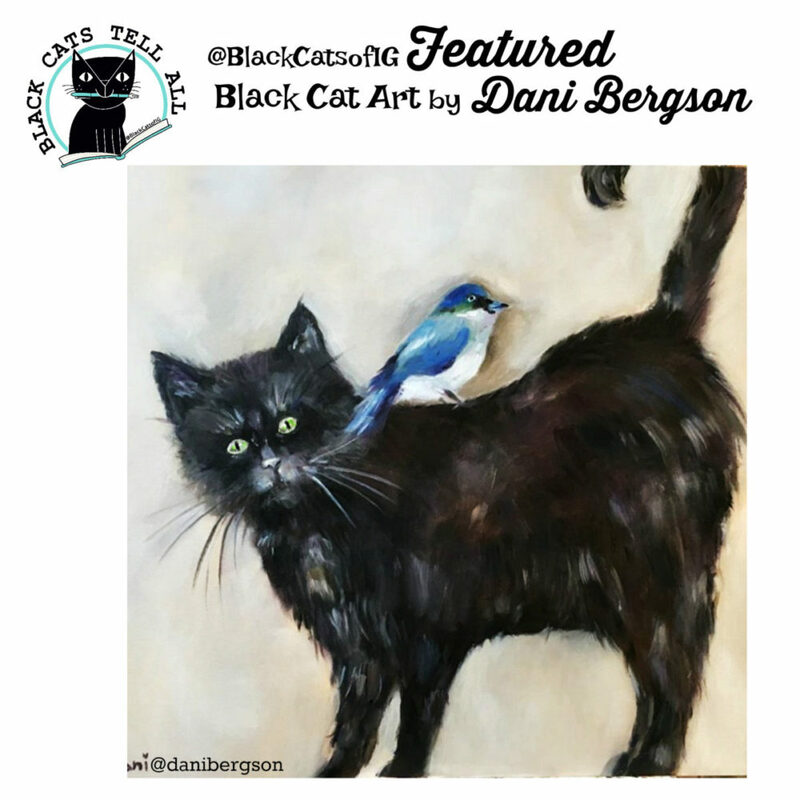 The whimsical painting of a black cat and blue bird by Dani Bergson brought a smile to my face. We hope it brings you a blue bird of happiness kind of week. 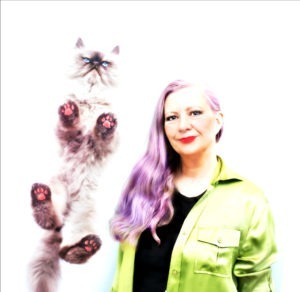 Dana is an artist based in London and just exhibited at CatFest. You can visit her on Instagram at @danibergson or website. And a bonus feature here since we can only feature one account at a time on Instagram. Ta da… the wildly fun Peppa Potter because you can never have too much cute cat art. How cute is this signature by Gretchen Wangmeiqiu an artist/illustrator who reminds of a looser, more modern Louis Wain. Love her bad boy kitties. I love the cat art. that artwork is darling just darling! Have been thinking about you and it is great seeing you here! Caren, thanks and ditto. Talk soon! I love all of the art! I couldn’t choose a favourite because they are all beautiful in their different ways. Gotta say I loved all of those artists work. Wish I could have gone to Catfest, but hope to go next year. I hope next year is better. It was a mixed response this year. Very cool art. I’ve found that it is difficult to share IG videos in general, unless they are part of the normal feed. Maybe when it comes to IGTV and highlights, what goes on on IG stays on IG? Actually, I can share from IGTV to fb but not embed on WP, at least not yet. Art, cats, life is good. WOW!! Luvin the Fabulous art work!!!! We like them all and they all brought a smile to our face! I attend art fairs, just to find unique cat artwork! Thanks for sharing these, and I’ve started following on IG! “you can never have too much cute cat art” Exactly~ thanks for the post! Love this art! Good capture of cat cuteness by all artists! Thanks and so nice of you to stop by! Oh what wonderful cat art – I am particularly drawn to Peppa Potter’s work……too cute for words! Agreed. Cute but a side of quirk so it’s not too sweet.